Alphastrut® is the simple to install and adaptable aluminium strut system perfect for cable management solutions and overhead support grids. Aluminium’s naturally high strength to weight ratio means the Alphastrut channels can be used to form support grids that are at least as strong as traditional steel systems, while offering cost savings over galvanised and stainless steel alternatives. 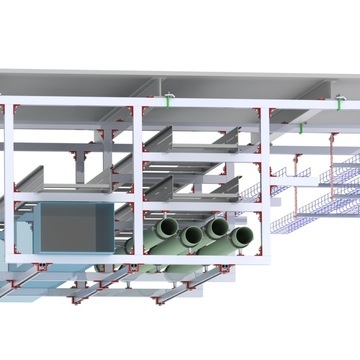 As well as being a cost-effective choice for your project, Alphastrut is also a practical option that reduces fit-out times and is reconfigurable post-installation to accommodate new services. Why specify Alphastrut for your project? Alphastrut offers a range of benefits that make it a practical and cost-effective choice for a wide variety of projects. Cost - Alphastrut materials are cost competitive with galvanised steel alternatives and can deliver savings of around 50% over stainless steel products, with an additional benefit in the form of lower fit-out costs. Simple installation - Alphastrut was developed to be quick to fit in both new developments and retrofit projects. It is a fully bolted system that requires no welding to assemble and no welded starter brackets to add service supports. As the channels are aluminium they can be cold cut on site, with no requirement for an off-site sawing area or cut end treatment. High strength - the system has excellent load-bearing properties and can be designed to meet the specific requirements of your project, making it the perfect choice for services support grids. Its strength also makes it ideal for applications such as supporting solar panels and cladding systems. Easy cable routing - Alphastrut was designed with the need to simplify the routing - and re-routing - of services in mind. 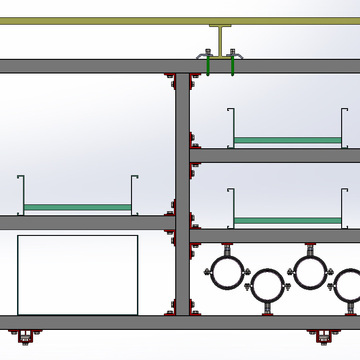 When used overhead it can accommodate electrical, data, mechanical, instrumentation and HVAC services, along with architectural supports and partition wall headers - while providing simple access for maintenance and additions. Improved site safety - the low weight of Alphastrut aluminium channels reduces the risk of manual handling injuries, while the lack of hot works required for installation further improves safety. Adaptability - Alphastrut offers complete design freedom and can be adapted to work as a service support grid in any room. It allows for a large number of overhead suspension points in all directions, making a huge range of configurations and reconfigurations possible. Zinc free - unlike galvanised steel channels, Alphastrut is zinc free and non-shedding. As such, it is suitable for use in environments such as data centres, clean rooms and food production plants. Corrosion resistance - Alphastrut benefits from exceptional corrosion resistance so can be used in any internal setting and is durable enough to cope with most external environments, including ones where more expensive stainless steel channels have typically been seen as the only option. It does not require painting, but can be supplied powder coated if required. 100% recyclable - Alphastrut is made from 100% recyclable materials, so will fit with any environmental policy. It is also non-toxic, safe to handle, causes no adverse run-off to groundwater, is non-combustible and non-magnetic. Raised access flooring - The Alphastrut grid’s adaptability and strength make it the perfect choice for raised access floors in many environments. Cable ladders & baskets and service supports can be attached directly to the grid and legs, while adjustable leg lengths allow for large cable ladder runs on multiple tiers with maximum cable separation. Unlike pedestal floors, Alphastrut is structurally sound before the tiles are added, providing easier access for installing cabling. Its load-bearing properties make it ideal for data centres and control rooms, as it can be designed to support heavy server racks and equipment cabinets without any requirement for sub-floor plinths. Click here to find out more about using Alphastrut for raised floors and our in-house design service. Contact Multi Metals to request a quote for or further information about the Alphastrut cable management solution. Download the datasheets below to find out more about Alphastrut. Contact Multi Metals today to discuss how Alphastrut could reduce costs and fit out times on your project.